Save a Tooth or Get an Implant? If you haven’t guessed it already, we’re talking about your teeth. One of the goals of modern dentistry is to help keep them healthy and sound because, after all, they’re supposed to last for a lifetime. Given the harsh environment of the oral cavity, this can be a challenging job; yet advances in dentistry are now helping more people keep their natural teeth longer than ever before. Unfortunately, teeth can be compromised by decay, trauma, or loss of supporting bone from periodontal (gum) disease. During the past 40 years, great strides have been made to replace hopeless or missing teeth with dental implants. This current tooth replacement system has a high long-term success rate — upwards of 95 percent. Yet the question remains: If the natural teeth can be saved, are implants truly a “better” treatment option? And if you want to save your own teeth, what alternative treatments might be needed? 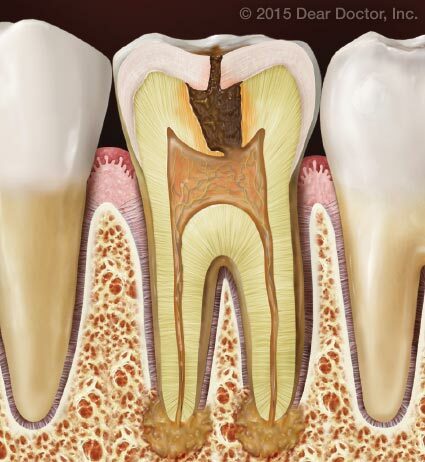 Decay can progress deep into the tooth and, if untreated, contaminate the pulp (nerve tissue) causing an infection at the end of the tooth roots. You hear it all the time: We have too much sugar in our diets! While many think of this as a general health problem, our diets, combined with lack of dental care, can directly result in tooth decay (an infection caused by acid-producing bacteria). Another threat is a silent one: bone loss around existing teeth from periodontal (gum) disease. Since there is often no pain associated with this slowly progressive “silent” problem, it may not be detected until you see a dentist. Finally, trauma from sports injuries, accidents, clenching/grinding, or other habits can result in loss of tooth structure or fractures. As well as compromising tooth structure and function, severe decay or trauma results in infection of the living pulp tissues or “nerve” of the tooth necessitating root canal therapy (RCT). For the great majority of people, RCT is very successful. However, it may be tempting to simply replace a problem tooth with a dental implant, and forego the (perceived) uncertainty and cost of RCT and subsequent restoration of the affected tooth. Several new studies indicate that the choice isn’t so clear-cut. For one thing, root canal therapy enjoys a success rate similar to that of dental implants, which can also make it a less expensive and more conservative option. Root canal therapy is one of the most effective procedures for retaining teeth that have been compromised by severe decay or structural problems affecting the pulp tissues. It has been in routine use for decades. A general dentist or endodontist (root canal specialist) can perform the procedure. It begins by gaining access to the tooth’s interior via a small opening made in its surface. Next, diseased or dead pulp tissue is removed from deep inside the tooth, the canals themselves are cleaned and disinfected, and the tooth’s interior is sealed against re-infection. Prosthetic posts are sometimes needed, placed in the root canal to help retain a restoration — a crown or “cap” — that is generally placed to protect and restore the tooth to normal appearance and function. The left side shows normal bone height and gum tissue attachment to the tooth surface; only a small space is present between the gum and tooth (usually 2–3 millimeters). 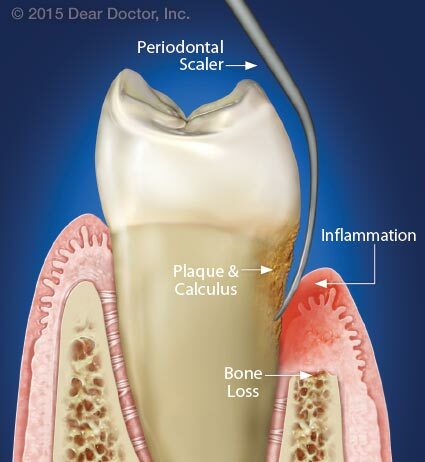 On the right, dental plaque, calculus, inflammation and bone loss is reflected by a deeper “pocket” of 5 millimeters. A hand instrument or ultrasonic device called a scaler is used to remove plaque and calculus from the “periodontal pocket.” This will eliminate inflammation — as long as good oral hygiene is also performed at home. While tooth decay is bad, it isn’t the leading cause of tooth loss in adults; periodontal (“peri” – around; “odont” – tooth) disease is. 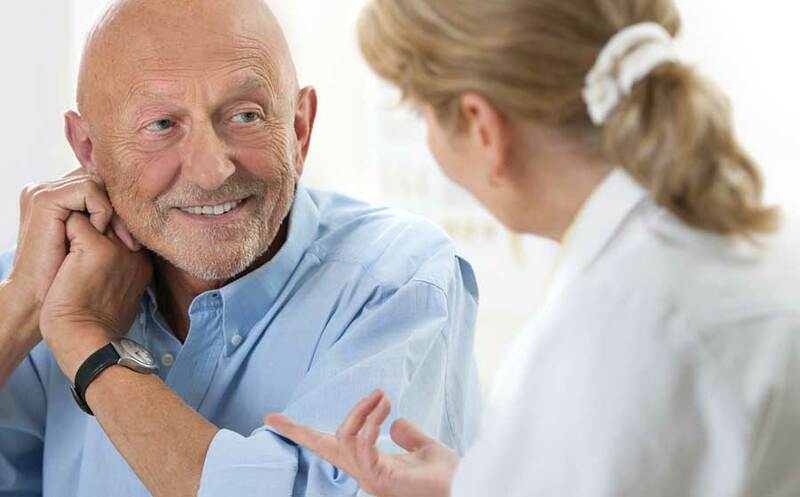 It affects almost half of Americans over 30, and some 70 percent of those over 65. This condition is also caused by bacterial biofilm (dental plaque), a thin, sticky layer that collects at the gum line. Undisturbed, the biofilm grows and changes, becoming more pathogenic (disease causing) over time. This in turn causes ongoing inflammation and infection in susceptible individuals, which results in disruption of the gum tissues and the periodontal membrane that joins tooth to bone; this ultimately leads to bone and tooth loss. To fight gum disease, general dentists and/or periodontists (dentists who specialize in treating the supporting tissues of the teeth) often use a treatment called scaling and root planing. This deep-cleaning procedure is used to remove the layers of biofilm (dental plaque) and calculus (tartar) from the affected root surfaces. In more advanced cases, surgical treatment may be needed as well. Successful control of gum disease requires an individual to take an active role in maintaining good oral hygiene — including effective brushing and flossing, plus healthy lifestyle changes (like quitting tobacco use) and regular professional maintenance. Not all root-canal-treated teeth last forever. Retreatment may be needed for reasons of: recurrent decay; root canal reinfection; or fracture of a restoration or the tooth root. The decision to retreat an already compromised tooth becomes more difficult, and other options may be considered. From the dentist’s perspective, the decision to replace a root-canal-treated tooth, or teeth, with dental implants will depend on many factors, including the reason for failure, the integrity of the tooth and its roots, and the patient’s overall health, both oral and general — and, importantly, what may be involved in a root canal re-treatment. At this stage the tooth may need to be “disassembled” in order to retreat and save it. This may well entail removing the restoration (crown) and sometimes a post (used to retain the crown of the tooth) in order to access and retreat the root canal/s. Root canal specialists often have sophisticated microscopes that aid in the retreatment process. At this point the overall cost may play a decisive role in weighing the alternative treatment of a dental implant. When modern advances in saving teeth are taken into account, the real “success” rate of both procedures could turn out to be roughly comparable. Teeth that require extensive periodontal treatment may present a similar conundrum — with one major difference: While root canal problems tend to affect a single tooth or teeth, periodontal disease, by the loss of supporting bone structure, usually affects several (or even all) teeth. Yet treatment of all but the most aggressive forms of periodontal disease can be quite successful. Excessive loss of bone, however, may require the additional step of bone grafting to rebuild the lost structure to provide a foundation for dental implant placement.